"Ran is an anti slip device that is an excellent solution for the trekker and the trail runner on snow, icy trails, wet grass or simply hiking on steep, muddy terrain. It can be helpful for hunters and mountain photographers, and also for professionals who operate on snow covered or icy terrain: e.g. park rangers and woodsmen operators at ski resorts. The Ran strong points are: Its ability to adapt itself to different types of shoes, from those for trail running to those for trekking, the silicone band that requires no adjustment with screws, screwdrivers, or other tools; the steel spikes that have anti-corrosion treatment; and a Velcro band to ensure stability on the foot once fitted. Delivered in a useful bag. 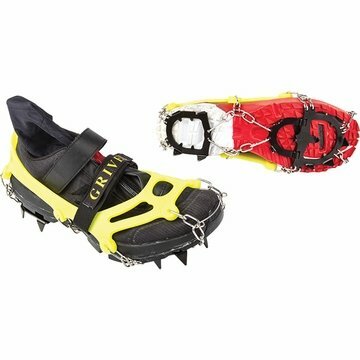 Warning: Ran is an anti slippery device and is NOT a crampon for alpinism. It is not a PPE. Ran Light Weight: 299 grams 10.5 ounces"